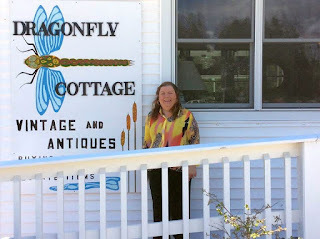 AcadiaChamber Press: Welcome to New Member Dragonflys Cottage! Say hello to our newest Chamber Member, Lynn & Carl Wehrfritz of Dragonflys Cottage, Southwest Harbor's newest Vintage & Antiques store. Located in the Westside Market Plaza at 101 Main Street, Dragonflys Cottage has plenty of parking available as you browse their wonderful selection of vintage wedding gowns, antique and vintage dinnerware, paintings, jewelry, furniture and much much more! Dragonflys Cottage is currently open on the weekends but will be expanding their hours soon. To check on hours, call: 207-479-2500 or 207-244-0255. Lynn would love it if you stopped in to look around!